Enjoy the Gulf Breeze at Our Hotel in Cape Coral, FL. Fifty miles south of Sarasota and just across the bridge from Fort Myers, FL is where you'll find the quaint peninsula city of Cape Coral. This planned city with more than 400 miles of canals is home to a host of great restaurants and attractions, so you're sure to enjoy yourself whether you're here for business or pleasure.The Holiday Inn Express Cape Coral, Fort Myers Area is a Southwest Florida hotel near many area companies, including Chico's World Headquarters, Deep Field Technologies Inc., GE in Fort Myers and Whitney Education Group in Cape Coral. Our hotel also offers a 24-hour Business Center and free high-speed Internet access in every room. 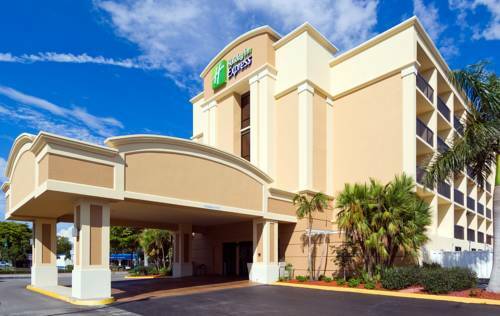 When you stay at our hotel, Cape Coral, FL and its attractions are at your fingertips. Spend the day fishing and shelling on Sanibel and Captiva islands, explore the winter estates of Henry Ford and Thomas Edison, watch the Minnesota Twins and Red Sox during spring training, or shop at the Miromar Factory Stores and the Tanger Outlets. And, if laying on the beach and playing in the surf are more appealing, Fort Myers Beach is just 10 miles from Cape Coral.As a hotel guest, you're able to enjoy fantastic amenities such as a huge outdoor pool, a Fitness Center and our complimentary Express Start hot breakfast. To enjoy this Gulf Coast haven and everything our Southwest Florida hotel has to offer, make your reservations today! The combination of healthy fresh food, relaxed atmosphere, and live Jazz in the courtyard has made it a hit with locals as well as the area snow birds. Wine and Roses is a great spot for a quiet dinner for two or for your group up to 100 or family. As you would expect, we feature a large wine list and a rose on every table. Excellent location, walking distance from the hotel! Gulf Coast Towne Center is the newest place in the area to go to for dining, shopping, and entertainment! Regal Theatre, Bass Bro Shop, and Ron John's Surf Shop are just a few of the attractions to please you! This is not just a mall. Coconut Point is a beautifully designed 500 acre community with a tremendous variety of stores, restaurants, office condominiums and residential units. There is also a movie theater, Muvico 16. Cape Coral's finest Municipal Golf Course. 27 hole championship golf course. We have combined 50 acres of sparkling lakes, natural wetlands, and the friendliest golfers in Florida. Gordon Lewis designed layout with four sets of tees will challenge players of all skill levels. Pelican Preserve is a beautiful 27-hole layout sculpted from luscious landscape that runs through a very upscale residential community. The course is wonderfully maintained from tee to green, with plentiful soft white sand bunkers dotting the way. In Bokeelia, Florida features 5,596 yards of golf from the longest tees for a par of 71 . The course rating is 68.7 and it has a slope rating of 119 on Bahia grass. Designed by Gordon G. Lewis, the Alden Pines golf course opened in 1981. "The Eco Place with Outer Space"
Guided tours hourly 10 AM until 3 PM; audio and self guided tours available 9 AM 5:30 PM and include the historical homes, museum, laboratory and gardens. Botanical tours available on Thursdays & Saturdays 9 AM. Fort Myers Beach has jet ski rentals available, along with boat rentals, fishing charters, parasailing and much more! There are beautiful restaurants to enjoy the dining experience overlooking the Estero Bay or the Gulf of Mexico coastline. Aboard Key West Express, where getting there is half the fun! Climb aboard our sleek, clean, modern, air-conditioned high-speed ferries - Features sundecks, snack bar, cocktails, and big-screen TVs - and we'll have you there in just a few hours! Games played at Lee County Sports Complex, Home of the Fort Myers Miracle. Voted Southwest Florida's "Best factory outlet shopping center" eleven years in a row! Covered walkways, indoor & outdoor dining, playland, and covered kids' areas! See Fort Myers' dolphins, manatee, water fowl, and more! Daytime cruises also include special narration pointing out the sights. Enjoy delicious food and dancing with our climate controlled tripledeck paddlewheller and sightseeing on our open 3rd deck. Sanibel & Captiva Islands Florida are the perfect choice for a romantic getaway, a family trip or a nature vacation. 15 miles of unspoiled beaches, 22 miles of bike paths, 50 types of fish, 230 types of birds, 250 types of shells and 0 stop lights. THE HOME OF MAJOR LEAGUE FUN !! 4 Go Cart Tracks 19 Hole Miniature Golf 8 Batting Cages 6,000 sq ft Arcade Paintball Field & more!!! Come out and watch the hard-hitting Miracle, Fort Myers' very own minor-league baseball team. Whether it's Two-for-Tuesdays, Thirsty Thursdays, or many of the other promotions, you will be sure to have a great time! Big M Casino gaming boats sail year around from Fort Myers Beach, FL and Myrtle Beach, SC offering Blackjack and so much more, plus the loosest slots! Everglades Area Tours welcomes you to the very edge of the Florida's Last Frontier. The splendid natural world of Everglades National Park and the 10,000 Islands is opened to our guests with a variety of Guided Eco Adventures. Rick Treworgy began collecting cars in the early 1970s and hasn't stopped since. His museum has its own diner. Built in an abandoned Walmart, which gives some sense of its size. ~24 miles from Cape Coral. Large gator farm features a big mean one named Goliath. ~47 miles from Cape Coral. ~67 miles from Cape Coral.